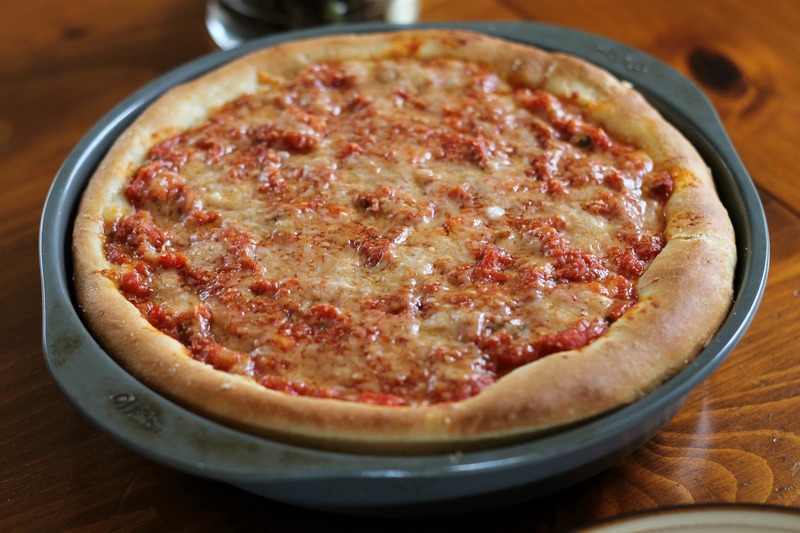 We’ve never been to Chicago before, so the deep-dish pizza we’ve been limited to has been from Uno Chicago Grill. It is pretty yummy, but it is super expensive for the amount of pizza that you get. Also, never, ever look up the nutrition facts like we did. It will ruin you for their pizza forever. Consider yourself warned. 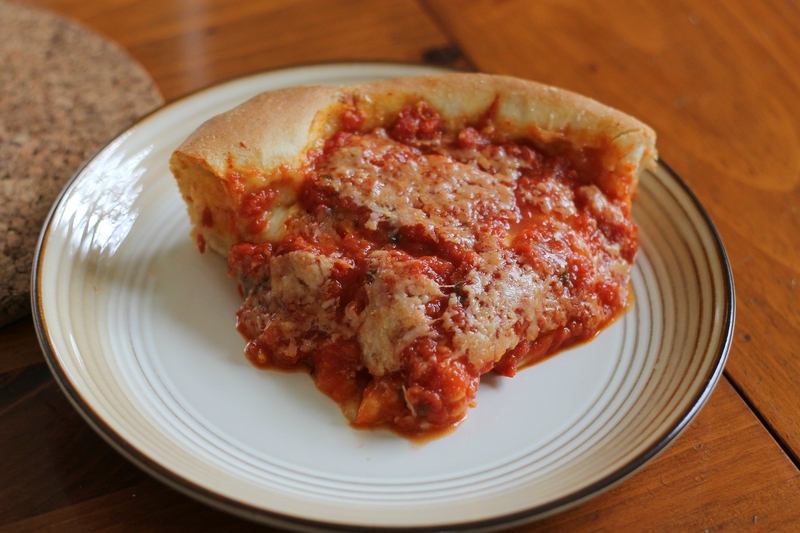 Anyway, we really wanted to make it at home ourselves because we didn’t want to give up on deep-dish pizza forever. We turned to trusty Cook’s Illustrated, and sure enough, they had a delicious sounding recipe. Seriously, it starts with laminating the dough with butter, almost as if you are making a pastry. That step is what gives it its slightly flaky crust and believe us, it is heaven. As if that isn’t enough, each pizza has a whole half-pound of mozzarella hiding under the sauce (maybe this pizza recipe isn’t way healthier than Uno). The sauce itself is pretty delicious too. It sadly involves grating onion, the equivalent to torture. Something about grating onions makes their eye-stinging ability turn into a superpower. Ouch. However, it’s completely worth it once you take a bite of the pizza. Invest in a pair of goggles, and you should be fine! P.S. Either embrace the messy slices like we did or wait a little longer for it to cool. Using a stand mixer fitted with a dough hook, mix together flour, cornmeal, yeast, sugar, and salt on low speed until combined, about 1 minutes. Add water and melted butter and mix until fully combined, 1 to 2 minutes, scraping down bowl as needed. increase the speed to medium and knead until the dough is glossy and smooth and pulls away from the sides of the bowl, 4-5 minutes. Using your hands, coat a large bowl with 1 teaspoon of olive oil, rubbing excess oil from your finers onto the blade of a rubber spatula. Using the oiled spatula, transfer dough to the prepared bowl, turning once to oil the top. Cover the bowl tightly with plastic wrap. Let dough rise at room temperature until nearly doubled in size, about 45 minutes to an hour. While the dough rises, melt butter in a medium saucepan over medium heat. Add onion, oregano, and salt and cook, stirring occasionally, until the onion is softened and lightly browned, about 5 minutes. Stir in the garlic and cook until fragrant, about 30 seconds. Stir in the tomatoes and sugar and bring to a simmer. Cook until the sauce has reduced to 2 1/2 cups, about 25 to 30 minutes. Off heat, stir in basil and oil, then season with additional salt and pepper to taste. Adjust oven rack to lowest position and heat oven to 435 degrees. Using a rubber spatula, turn the dough out onto a dry clean counter and roll into a 15 by 12-inch rectangle with the short side facing you. Spread softened butter over the surface of dough using an offset spatula, leaving 1/2-inch border around the edge. Starting at the short end, roll the dough into a tight cylinder. With the seam side down, flatten into an 18 by 4-inch rectangle. Cut the rectangle in half crosswise. Working with 1 half at a time, fold dough into thirds like a business letter, then pinch seams together to form a ball. Return the dough balls to the oiled bowl. Cover tightly with plastic, and let rise in the refrigerator until nearly doubled in size, 40 to 50 minutes. Coat two 9-inch round cake pans with 2 tablespoons olive oil each. Transfer 1 dough ball to clean counter and roll into a 13-inch disk about 1/4 inch thick. Transfer dough rounds to the cake pan by rolling the dough loosely around the rolling pin, then unrolling dough into the pan. Lightly press dough into the pan, working it into corners and 1 inch up the sides. If it resists stretching, let it relax 5 minutes before trying again. Repeat with the remaining dough ball. For each pizza, sprinkle 2 cups of mozzarella evenly over the surface of the dough. Spread 1 1/4 cups of tomato sauce evenly over the cheese, and sprinkle 2 tablespoons of Parmesan over the sauce for each pizza. Bake until the crust is golden brown, 20 to 30 minutes. Remove the pizzas from the oven and let rest for 10 minutes before slicing and serving. Enjoy!